First, we need to add the PPAs for conjure and juju. We need to update aptitude now that we have added the new PPA sources. I had to reboot before I could successfully run an update. So, go ahead and reboot your server and log back in. After a quick reboot, let’s update Aptitude. Next, we need to initialize LXC before we can install conjure-up and OpenStack. This step requires sudo (root), so it must be done before we can proceed. You will be prompted to answer some questions related to networking. Select “Yes” to set up a network bridge. Accept the default name. You will also want to select “Yes” when asked if you want to configure NAT. All other defaults can be accepted. IPV6 support is optional. Once you are back at a command line, make sure LXC is good to go. We will use the Aptitude Package Manager to install conjure-up. Once the conjure-up installation is finished, we can use it to install and configure our single server OpenStack environment. Now you will be presented with a menu. Select OpenStack with NOVALXD (you might have to scroll down to see it) and hit enter. This step is going to take a long time. How long, depends on how much RAM your server has, as well as the type of disk in use. First, conjure-up will download all needed Ubuntu Xenial images from cloud-images.ubuntu.com. That step will look like this. Once all images have downloading (nearly 100), it will start initializing the Juju controller. After this step, conjure-up will start deploying all containers needed for the OpenStack platform. This can take a very long time. If you see any errors about there not being enough units, just let it be and it will eventually continue. Eventually, it will finish and you will find yourself at the last step! After you run the creation of RSA keys you’ll be ready to start working on your new OpenStack environment! 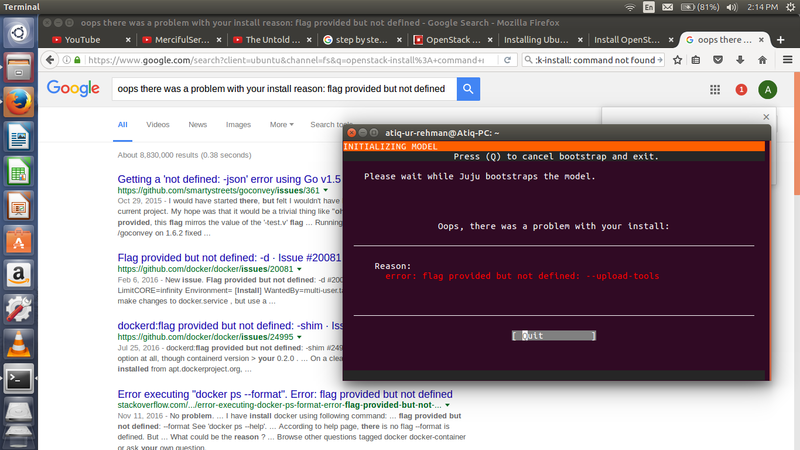 OpenStack can be a real pain to install. But, with the help of packages like conjure-up, it can be manageable. This type of deployment is great for development and getting familiar with the platform. In a production or lab environment, you will definitely want to consider adding more physical servers. Thank you for reading. If you get stuck, or have any questions, please feel free to ask for help in the comments below! I can’t find my previous comment. Do you have news about the bug of missing a file during the installation? We suffered a catastrophic server failure and lost 24 hours of data. We’re almost back to 100% functionality, just have to fix the images. WRT the Juju bug, as of yesterday it has not been fixed. I’m trying to fix it myself, although I haven’t had luck lately. As I said before, I’m working on a guide for an alternate method to install OpenStack without using conjure up. I will try to get that finished ASAP so you have options. Thank you. I used your guide on the 14.04 before. You are a great help for the community in general, great work. Thank you for that, I do this to help. I’m glad to know it’s appreciated. I’m still putting together a guide that actually works. There are SO MANY bugs with Ubuntu 16.04 AND the latest OpenStack deployment scripts. It blows me away. I think I have one put together that will work. I still have to run through it one more time with a fresh virtual machine to make sure it’s actually reproducible. Did you have any luck or are you still in limbo? Thanks! Evio, The new guide is complete and it’s MUCH easier. It’s even easier than the old guide based on Ubuntu 14.04 & Kilo. It will auto post in the morning and it will get you running OpenStack Newton (or any other version you’d like) on Ubuntu 16.04 easily. Thanks! Are you dead set on using conjure up? If not, my other guide using devstack works MUCH better and is much more reliable. It also uses less resources. Link is below. If you have to use conjure for some reason, let me know and we’ll see what can be figured out. it seems like I never able to pass through the state of “waiting for address”. Any suggestion? After the install is there a way to access the interface through the external IP configured on the host machine? Did you find how to access it from host machine , I have everything ready but not able to access the openstack ip addresses from host machine , any pointers ? conjure-up is already the newest version (2.1.0-0~201702170427~ubuntu16.04.1).